Createspace Independent Publishing Platform, 9781547220076, 324pp. Adam has a lot of stories to tell, which is fair given he's been alive for over sixty-thousand years. All of the stories are interesting, many involve alcohol, and five are collected for the first time in The Immortal Chronicles The books in this collection take Adam from the Barbary Coast of the 1500's, to England at the turn of the 19th century, Vienna of 1815, Chicago in the 1930's, and 1950's New York. He spends time with pirates and assassins, a succubus, a shape-shifting monster, a madman who can see the future, and Santa Claus. 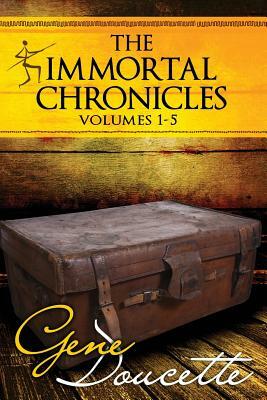 The Immortal Chronicles is an ongoing series of novellas from Adam, the star narrator of the Immortal Novel trilogy (IMMORTAL, HELLENIC IMMORTAL and IMMORTAL AT THE EDGE OF THE WORLD.) Collected here for the first time: IMMORTAL AT SEA, HARD-BOILED IMMORTAL, IMMORTAL AND THE MADMAN, YULETIDE IMMORTAL and REGENCY IMMORTAL. Catch up with Adam now.